Princess Mabelrose was born into a utopian society. Her father and mother ruled the land with love, fairness and justice. One day an evil Dragon, whose name is too long to reproduce here, swoops in and using some form of magic kidnaps Mabelrose, locking her away in the dragon’s fortress. In this case the dragon makes a habit out of stealing young aristocratic girls and keeping them hostage. As any young princess does, Mabelrose waits for some prince to come and save her. After some time, she realizes that if she is to escape, then she must muster the strength to do it herself. She tricks the dragon, using his greed and suspicious nature against him. On the way out she steals gold and some magic accessories: boots, a bag and a rope. Along her journey she makes friends with one of the lands talking beasts, a porcupine. Her troubles are not over. All of the dragon’s evil minions are after her, including the evil and the tyrannical Tiger-King. Espinosa loves setting up the traditional utopian fairy tale and then assigning non-traditional roles to the characters, especially the women. This makes for an interesting modern story that makes use of some old story telling techniques. He pulls off the difficult task of creating a story that does not sound like it has been scrubbed or written out of a need for political correctness. Like many fairy tales, the characters tend to be flat, with the exception of Mabelrose and she doesn’t really change or develop an extraordinary amount. This is not a problem or even a criticism. Fairy tales are some of the best-loved children’s stories. While he does keep to some traditions, he abandons others. I think children will love the fact that Mabelrose finds her own courageous to free herself and eventually free all of the people and creatures in the land. There are a couple of things that I found particularly enjoyable in the book. There is a cast system within the cultures of the animals. Some animals speak and others do not. Even among those who speak there is a cast system and those talking animals who live in the forest and eat meat are looked down upon by those who live in the city. I also liked the introduction of the magic, living rope. While the rope does not talk, it seems to have a life of it’s own. It transitions from being an inanimate object to becoming a character within the story. I was troubled by a couple of things. Espinosa misuses some pieces of grammar and it becomes distracting. In most cases he uses the ellipsis incorrectly. The ellipsis is made up of three periods (…) not four or five or nine or however many a writer chooses to use. I understand that this may be inconsequential to some comic readers and I may be too picky. However, I argue that it is important for writers, especially comic writers, to use good grammar and spelling in order to be taken seriously. Comic or not, there is never an incident when it is necessary to use multiple exclamation points or question marks. One exclamation point (!) or one question mark (?) is enough to inform the reader of the intentions. We would not use two commas nor should use five periods. The other issue involves the story itself. Toward the end of the book Mabelrose steals a magical flute from the Tiger-King and plays it. The playing of this flute conveniently kills the dragon and unites the people against the tyranny of the Tiger-King. There is little known of the flute. It seems to just appear and fix everything. I would have preferred a little more surrounding the flute and some discovery about it. Knowing how to use the flute, why didn’t the Tiger-King just use it against the dragon years ago and take over the entire nation? THE COURAGEOUS PRINCESS is a full color manga graphic novel. That is a rare thing, but it is beautiful. Espinosa has a knack for creating great looking manga-styled images. This book is one way to introduce race relations with the children without actually addressing white/black or other racial tensions outright, at least at first. Students can explore how some talking animals treat other talking animals based solely on their location and culture. Through this discussion, current racial tensions can also be explored. My problems with the appearance of the magical fix-all flute can have some advantages in the classroom. Good readers may question the flute and find fault. This could make for good discussion about the art of writing and plot development. More than that, what I label as a weakness in the writing could turn into a fun writing assignment. The students could write their own story about how the flute came into being and from where it derives its power. Kids could really have a fun time making up their own origin stories. Spirituality is an integral part of the life and culture of Princess Mabelrose. The book never states the name of the religion, but she is often seen praying for herself and others. This could be a problem for some teachers or some areas. I do not see it as a problem for my community and in fact, I found it to be one of my favorite features of the story. 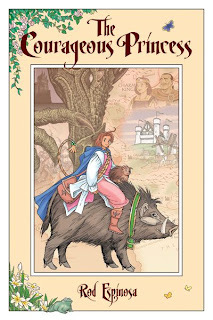 Espinosa’s THE COURAGEOUS PRINCESS was nominated for an Eisner Award for “Best Title for Younger Readers” in 2002. This title is also available in hardback. 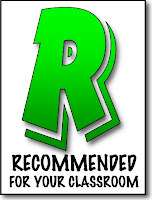 Other Espinosa titles reviewed by THE GRAPHIC CLASSROOM: Neotopia. This is a great book to have in the classroom or school library.